WARNING: Long post ahead… In the pursuit of attracting those who are in the same vibration, I have gained immense knowledge and continue to develop the skills necessary to impact the world within my reach. 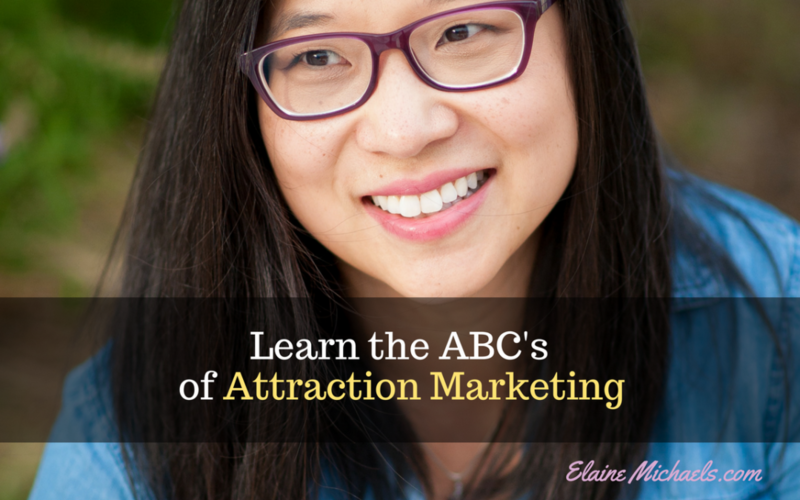 Here are my ABC's of Attraction Marketing I want to share with you! Attract your tribe. Don't be afraid to stand out of the crowd for your passions. Own it. Resonate with others who share your passions. This means giving YOU the most exposure out there. Be sure to open up any channels to broaden your reach. Believe in Yourself. Not being full of yourself. Believe wholeheartedly in your current skill level, where you are in your journey, and where you're headed. You were meant to be right where you are. Keep believing. Even if no one else believes in you, you must believe in yourself. If you need more belief, listen to Journey: Don't Stop Believing. Consistency takes the cake. Taking specific actions every. single. day. When you become consistent you will create your own vibration. Daily Actions are the simples steps that are the foundation of any fearless leader. Need Daily Steps to model? Grab mine here. Eliminate the unnecessary. In life there is no shortage of distractions. Focus on the few essential items and execute, execute, execute! Goal oriented direction. Set goals big and small. Do you have the goal of Firing Your Boss? Write it down where you can see it every day. Take that BFHG (big fat hairy goal) and break it down into smaller steps, working backwards. Then take each step and execute. Know that each step is getting you closer to your BFHG. Have a Helping Heart. Make your mission to help others. Helping others achieve their goals will ultimately will help you achieve yours. Ignite the fire that which is within you. Then fan the flames with podcasts! Listen to my list of podcasts to 10x your day! Checkout Entrepreneur on Fire with JLD. Jab, Jab, Jab and then Right Hook!! If you haven't read Gary V's book, this is on that you need to pick up! That's right, don't pitch the minute you're outta the gate. Kindness will go further than you will ever know. Let Go of Your Past. Push aside all the things people told you or you told yourself that limit you from pursuing your dreams. They no longer exist. They are not truths. Figure out YOUR truths and move forward. Always keep moving forward. Mental Rehearsal is powerful for mindset training, productivity, and purpose. Don't underestimate the power of your mind. Feed your mind continuously with books, audiobooks, webinars, live seminars, masterminds, meet-ups, articles, tutorials, youtube videos, etc. Spend time visualizing your success whether it is your ultimate success (your perfect day) or a goal you want to achieve today. “NO.” Get familiar with this word. Successful leaders are very good at saying no. They stay on track towards their goals and are relentless. No also eliminates the shiny object syndrome that might distract you from the ultimate goal. And no negativity! That repels! Ordinary is Out. Embrace the fact that you are weird. Own it and be proud of who you are. Who you are will will determine who you attract and also determine your target audience. Pay close attention to this. Persistence is 2 out of the 3 keys when you are in the pursuit of How to Get Clarity on Your BRAND and Growing your Online Presence. Long breaks sever the creativity flow and to start up again requires more energy. Get into a rhythm and keep persistently showing up and growing. Quit. Don't EVER quit on your dreams. But you can quit in your business everyday and start fresh each morning. Each day is fresh with no mistakes. Rise to the occasion. Roll with the punches. Revel in your successes. Rinse & Repeat when you have found your winning structure. If you haven't given your all, if you have quit before you even reach a milestone, if you have gotten too comfortable and complaisant, then you need to Rise Up. Read Maya Angelou's poem Still I Rise. Strive for meeting the better version of YOU every day. Only compare yourself to the person you were yesterday, not anyone else. Put your blinders on. What matters is only what you do. Teach others what you have learned thus far. A good mentor only needs to be 1 step ahead of her student. If you need to learn about Leads, Lead Magnets, or Writing a Blog, find a mentor and follow them. Then teach your audience from your experience and position yourself as a leader. Uniquely U. Don't pursue to be anyone else. YOU are what attracts people. Not the company, not the products, and not the service. It is whatever that is being offered by U. Get Clarity on your Brand. Video Marketing is what you need to be doing. Checkout how just a few videos landed me 6,500 views on my youtube channel! Video will give you the most exposure. Be proud of who you are, where you are, and your passions. Read about the power of Facebook Lives here. Watch Webinars to learn what is the latest and greatest. Then, turn around and host your own webinar. Do what others won't. X-tra mile. If you don't go the distance, someone else will. People can only be attracted to you if they see you. Success breeds success. Yes. Be a YES person. Open to ideas. Open to opportunities. Open to new experiences. Open to changing into the Better YOU. Zero to a Million in your own time. Be comfortable knowing that you put your best effort out there every day and you will get the success of your dreams. To checkout more videos like this one, go ahead and subscribe to my Youtube Channel, and you'll see the latest info I'm teaching. How an introvert like me catapulted myself into the online space? Get the ultimate library of tutorials to do just that. Just for reading this post, you can grab a 10 day/$10 Trial (risk free!) and have a sneak peak in the step-by-step training program, this non-techie Mom was able to Launch Successfully. Great post and I love that you had good advice for every letter! So many resonated with me, like letting go of the past, teaching, and don’t hit people with a pitch right out of the gate. I’m interested, though, in what you mean when you say your brand. Do you mean this website? Wow!! You thought of everything in this article. It was such a great read learning about ways to attract marketing. This may have been a long post Elaine, but it was well worth reading! Thanks for sharing, I’ll be saving this for sure. This would be a great opportunity to learn more about marketing, I am so excited about the free trial. As a blogger, these tips on attraction marketing are definitely important to learn. I agree that it all starts from being confident with oneself before one can get to resonate with others with the same passion which will always spark that determination within. Also, persistence and consistency are key that will ensure we rise up to the occasion whenever that calls for. Great tips! I have never worked in marketing but as a blogger I am very much learning to market my self! Exactly. You need to attract others to you and your message on your blog!! Absolutely for you! I love how you talk about taking action each day! This is something I have always struggled with. It can seem like nothing is happening short-term, but long-term, the magic happens! Thank-you for sharing. All of these things are good when it comes to marketing. I think the hardest thing I have found is developing my tribe. I really need to do more work on this to be honest. I know I have made many friends who enjoy my stuff, but I need to find people who are moved to stick around and keep the conversation going. And there is also power in referrals when you teach others. What you teach can resonate with someone who loves it so much they spread the word! I love how you’ve put this into easy to understand ditailed little steps! Very helpful! I learned to say no a lot recently and that made me more confident in what I really want for my business! It’s hard in blogging but you covered some really essential points! Those are some great tips! I think it’s really important to learn more about marketing because it constantly changes and there are so many strategies to try as well. ORDINARY IS OUT!!! YES! What an INCREDIBLE POST! Long but powerful. I love how you tied this in to BUSINESS and your PURPOSE!!! This is a very inspiring article, Elaine. This is one I will bookmark and come back to again and again when I need inspiration. I especially like the idea of mental rehearsal. It is very important to visualize your goals and to continue working your mind on nene ways. I love your point “Make your mission to help others” Your tips are so encouraging and are absolutely applicable to all aspects of life! Another brilliant post once again. Marketing is my weakest area and I enjoy reading the tips on your blog. Consistency – so true, but I don’t do it when it comes to marketing! This is a really great post. I think that I need to believe in myself more. I have had so many put me down over the years that I really do lack confidence in my abilities quite often. Melanie, you just need to believe in one person. 🙂 And its you! Read my other blogpost on Morning Affirmations to build your confidence! You’ve got this! This quotes shares sentiments I live by daily! I always struggle when it comes to marketing. 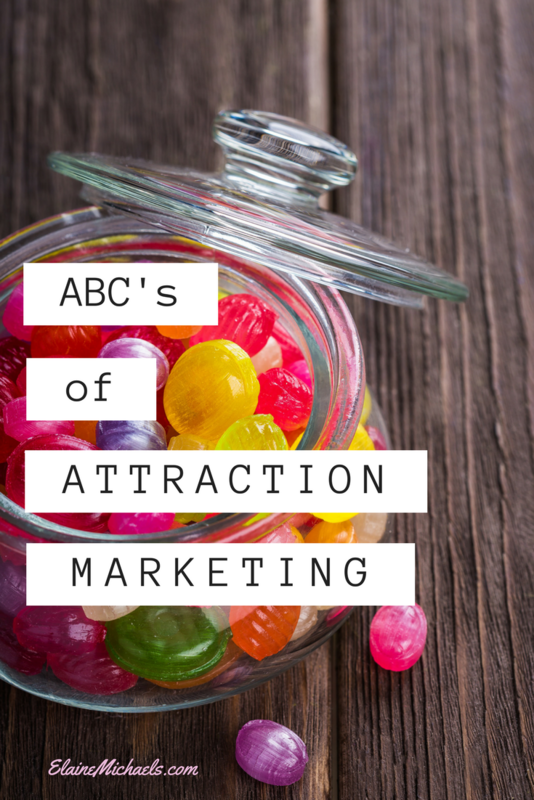 Thank you for this amazing post, you really did a fine job explaining attraction marketing to me. I love read about marketing and I really use those tips! Very useful post for me, thank you so much! Read this post over and over again and really took so much advise from it. Excellent piece and full of great tips. I had never heard this term before. This was crazy to read about and you were so through with the do’s, don’ts, in’s and outs. Thanks! Oh wow! That was a super impressive list of a through z. I think that having a mission to help others is really an important one! I loved all your tips but the best one is “Believe in Yourself”. If you can believe in what you do, then you are halfway there! I’ve never heard of the term “attraction marketing,” but the tips were right in line with the overall principle. The point about avoiding distractions hit home the most with me.